Ever thought of putting mustard in your dessert? Well, now’s the time. Harry Lalousis, aka mustard sommelier, aka the mustard man, is about to blow your mind. You may only think of mustard as a condiment -- as the mustard to your hotdog, or the mustard to your cheese toast -- but Lalousis is here to tell you that mustard is a wonderful ingredient with the power of intensifying flavour in savoury and sweet dishes. You can even add to it cocktails. “It’s an ingredient to me, not a condiment -- I use it everywhere,” Maille mustard sommelier Harry Lalousis told The Huffington Post Australia. Born and raised in Brisbane by Greek-Italian parents and with a chef background, Harry Lalousis is only one of three highly trained mustard sommeliers in the world. In other words, he really knows his stuff. “I got into it deeply because it interests me so much,” Lalousis said. After intensive training in Dijon, France, Lalousis was approached by French brand, Maille, to open the first London mustard boutique which he “jumped at the opportunity”. "For me, the training never ends -- there’s always something to learn and every day I find a different way to use the mustard,” Lalousis said. According to Lalousis, mustard is an undervalued ingredient that doesn't have to be limited to meat-based dishes. Due to their bitterness, black mustard seeds are primarily used in cooking, but it’s the white (also known as yellow) and brown mustard seed that work their magic in mustard. “The brown seed is a pungent seed but it’s also quite subtle in the taste -- it’s not as bitter as white mustard seed,” Lalousis said. 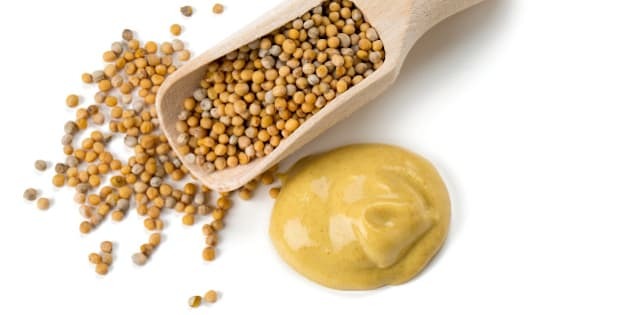 Although mustard has many faces -- from American yellow mustard to sweet and spicy German mustards to Italian fruit mustard -- according to Lalousis, these stem from three traditional mustard varieties. According to Lalousis, an English mustard is more considered to be used as a condiment on, say, a sausage, steak, hotdog or in a burger. According to Lalousis, the French mustard is the variety preferred by chefs in their cooking due to the way the mustard pushes out flavour in a dish. “Then you have the wholegrain mustard, which is basically just crushed mustard seed with wine (in the French case) and salt,” Lalousis said. The wholegrain is a newer form of mustard and also comes as a hybrid. Along with these three main varieties are many intriguing flavours, which are infused into the mustard base. Imagine raspberry and basil mustard, and pistachio, orange and white wine mustard. “For infused mustard it’s always a Dijon original base,” Lalousis said. Never thought to add mustard to desserts and cocktails? Neither did we, until now. “What you can do is mix a mustard with mascarpone cheese and icing sugar,” Lalousis said. “I quite like using raspberry and basil mustard --it infuses the mascarpone cheese with the flavours of the raspberry and basil, rather than the mustard." “This is what is brilliant about using mustard in desserts -- it’s cuts through that sweetness and balances a dessert,” Lalousis said. Adding a sweeter mustard to a creamy topping can take waffles to whole other level. “If you do waffles, you can just mix a teaspoon of blackcurrant mustard with some cream and pour it on top,” Lalousis said. “You can also do it with savoury pancakes -- you layer the pancakes with Gruyere cheese and put it in the oven for 10 minutes for the cheese to melt," Lalousis said. "In the meantime, mix cream with the blackcurrant mustard and then pour the mixture over the pancakes when they come out of the oven." “The pancakes absorb all that flavour so you’ve got a beautiful, savoury layered pancake." “My favourite is the honey mustard and my best way to use it is to smear a puff pastry sheet with mustard and top with Gruyere, Comté or mozzarella cheese and then salami or prosciutto,” Lalousis said.